(CBS/AP) CAIRO - Amnesty International has called on Egyptian authorities to investigate reports of sexual assaults on women protesters in Cairo's Tahrir Square in order to end impunity for repeated attacks. The London-based rights group said Monday women are singled out by mobs for sexual harassment and assaults in the epicenter of the uprising that toppled Hosni Mubarak last year. The group said the attacks are an attempt to intimidate women and prevent them from participating in public life. In the face of a rise in violent attacks on women, activists organized a rally Friday to demand an end to the harassment. A group of men attacked the rally, groping women, tearing their clothes off and robbing them despite attempts by men to fend them off. Amnesty said authorities never investigated the attacks. From the ferocity of the assault, some of the victims said it appeared to have been an organized attempt to drive women out of demonstrations and trample on the pro-democracy protest movement. The attack follows smaller scale assaults on women this week in Tahrir, the epicenter of the uprising that forced Hosni Mubarak to step down last year. Thousands have been gathering in the square this week in protests over a variety of issues - mainly over worries that presidential elections this month will secure the continued rule by elements of Mubarak's regime backed by the ruling military. Friday's march was called to demand an end to sexual assaults. Around 50 women participated, surrounded by a larger group of male supporters who joined to hands to form a protective ring around them. The protesters carried posters saying, "The people want to cut the hand of the sexual harasser," and chanted, "The Egyptian girl says it loudly, harassment is barbaric." After the marchers entered a crowded corner of the square, a group of men waded into the women, heckling them and groping them. The male supporters tried to fend them off, and it turned into a melee involving a mob of hundreds. The marchers tried to flee while the attackers chased them and male supporters tried to protect them. But the attackers persisted, cornering several women against a metal sidewalk railing, including an Associated Press reporter, shoving their hands down their clothes and trying to grab their bags. The male supporters fought back, swinging belts and fists and throwing water. Eventually, the women were able to reach refuge in a nearby building with the mob still outside until they finally got out to safety. "After what I saw and heard today. I am furious at so many things. Why beat a girl and strip her off? Why?" wrote Sally Zohney, one of the organizers of the event on Twitter. The persistence of the attack raised the belief of many that it was intentional, though who orchestrated it was unclear. Mariam Abdel-Shahid, a 25 year-old cinema student who took part in the march, said "sexual harassment will only take us backward." "This is pressure on the woman to return home," she said. Ahmed Mansour, a 22 year-old male medical student who took part in the march, said there are "people here trying to abuse the large number of women protesters who feel safe and secure. Some people think it is targeted to make women hate coming here." "I am here to take a position and to object to this obscene act in society," he said. 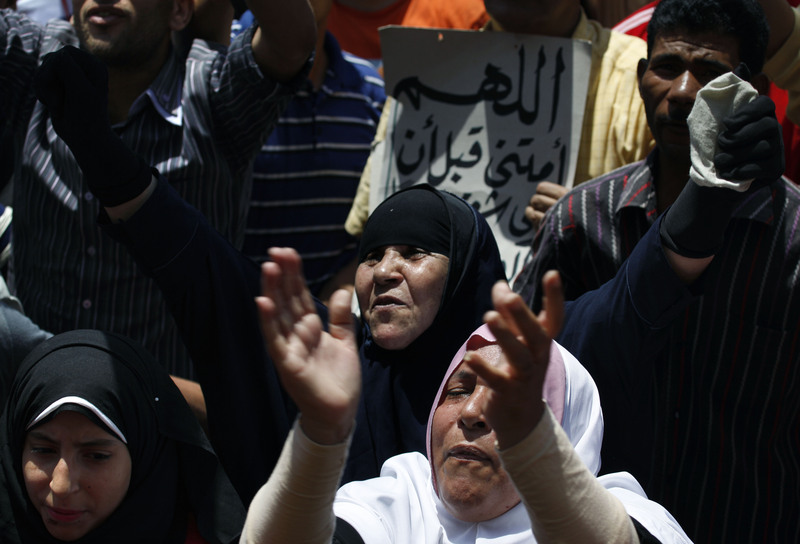 Assaults on women Tahrir have been a demoralizing turn for Egypt's protest movement. During the 18-day uprising against Mubarak last year, women say they briefly experienced a "new Egypt," with none of the harassment that is common in Cairo's streets taking place in Tahrir. Women participated in the anti-Mubarak uprising as leading activists, protesters, medics and even fighters to ward off attacks by security agents or affiliated thugs. They have continued the role during the frequent protests over the past 15 months against the military, which took power after Mubarak's fall on Feb. 11, 2011. But women have also been targeted, both by mobs and by military and security forces in crackdowns, a practice commonly used by Mubarak security against protesters. Lara Logan, a U.S. correspondent for CBS television, was sexually assaulted by a frenzied mob in Tahrir on the day Mubarak stepped down, when hundreds of thousands of Egyptians came to the square to celebrate. In a defining image of the post-Mubarak state violence against women, troops dispersing a December protest in Tahrir were captured on video stripping a woman's top off down to her blue bra and stomping with their boots on her chest, as other troops pulled her by the arms across the ground. In contrast, the small size of Friday's march could reflect the vulnerability and insecurity many feel in the square, which was packed with thousands of mostly young men by nightfall Friday. Twenty rights groups signed on to support the stand and hundreds more vowed to take part, according to the Facebook page where organizers publicized the event, but only around 50 women participated. Sexual harassment of women, including against those who wear the Islamic headscarf or even cover their face, is common in the streets of Cairo. A 2008 report by the Egyptian Center for Women's Rights says two-thirds of women in Egypt experienced sexual harassment on a daily basis. A string of mass assaults on women in 2006 during the Muslim feast following the holy month of Ramadan prompted police to increase the number of patrols to combat it but legislation providing punishment was never passed. "Women activists are at the core of the revolution," Hawary said. "They are the courage of this movement. If you break them, you break the spirit of the revolution."